If you're childhood was anything like mine, you grew up watching Little House reruns and wishing that you were Laura. Later on when I got a little older, I remember being enamored with a collection of the novels dear ole Saint Nick left for me under the tree. I couldn't wait to dive into Laura's world and envision everything in my mind. While I found this to be immensely fascinating as a kid, as an adult, I don't think I would have enjoyed life on the frontier. I'd miss my internet connection, book collection, and hot showers a bit too much to want to linger in that time period for too long, but there is something nostalgic about remembering my fondness for Laura and her family. I don't remember where I first came across this title, but I knew that one day I needed to work this beauty into my reading list. I've been on a bit of a nonfiction kick this year, so it seemed like the perfect time to borrow a copy from my local library and dive into someone else's view of Laura. I also was interested to learn about the true history and locations behind the famous series. As with anything else, there are strong devotees to the novels and those who favor the tv show. I've always been of the stock who wants to read the source material before watching a show or movie based on a novel. It was interesting to see that others make distinctions of this sort of nature as well. I like to think of myself as a purist - drawing my inspiration from the text source rather than relying on someone else's (aka casting director) vision of characters and settings. While I thought I was a Little House fan, I quickly learned that I was no match for Wendy McClure. As young readers, we both gravitated to these stories, but she advanced much further beyond that point in history, travel, and popular culture than I ever did. For instance, did you know that there is an anime about Laura Ingalls Wilder? Seriously, I was a bit shocked by that tidbit. That is cultural diffusion that I would never have predicted. McClure makes visiting the real locales and getting a sense of the true Laura as her mission. Throughout this book which is a bit memoir, a bit travelogue, and a bit historical nonfiction, McClure takes readers on her journey into "Laura World". She also gives credence to the concept that one can never go home again. As we age, the things we love as children may not look the same when we pick them back up in our later years. Even though she looks at the stories with fondness, as an adult, she notices topics such as racism that she didn't latch onto as a young reader. The interactions with Native Americans is a topic that reoccurs throughout the novels as well as McClure's writing. I was appalled to think about some of these scenes. The novels always wanted you to see the Ingalls family in a positive light which often cast the Natives in the role of villains, but history serves as an illustration why this is not the case in most instances. The Natives that interacted with Laura's family were often pushed off their land and mistreated by the white settlers. Often there was little recourse to right these injustices which spawned frequent conflict between the tribes and the white settlers. I see this conflict in a totally different light now as an adult; I am sure reading those scenes today would cause cringing on my part at the inaccurate historical portrayal. Bias aside, there is still much to enjoy about the Little House books as McClure seeks to showcase in this work. Her devotion to Laura is apparent in each chapter - especially when she tackles tasks like churning butter and finding remote locations where the Ingalls family once lived. While I don't think I'll be donning my bonnet and calico dress anytime soon for a trip back to the pioneer days, I can appreciate seeing a "fangirl" enjoy soaking up every detail about her preferred topic. I enjoyed watching McClure light up with each new tidbit she uncovered. As all of us who have experienced the euphoria of fandom (I'm currently deeply entrenched in the Outlander fandom - ah, Jamie but I have been a member of various other fandoms such as the Harry Potter universe - Ravenclaw for Life!) can appreciate the attention to detail and the need to learn as much as possible. While McClure indulges her inner fan girl by buying butter churns and seeking to recreate Ma's recipes, I was reminded about how I have interacted with various fandoms. It was fun to experience that through someone else's eyes. For me the biggest challenge of this book was McClure. There were moments when I was definitely on the same page with her thinking, but other times she felt a tad condescending. I nudged this irksome tidbit to the back of my mind and plowed forward with my reading. I think if you can connect with her as your narrator and Laura guide, you'll enjoy this read. There is a ton of information as well as many moments of humor to reward your efforts if you can manage to get through some jumpy pacing and form a connection with McClure. For me, the history elements were enough to keep me hanging on and turning the pages, in spite of the moments when McClure's snark was a bit much for my tastes. One Last Gripe: I don't think nerds/fangirls should judge other fandom members for being more or less into something. Live and let live. Enjoy that you have a tribe that loves something you do. First Sentence: I was born in 1867 in a log cabin in Wisconsin and maybe you were, too. 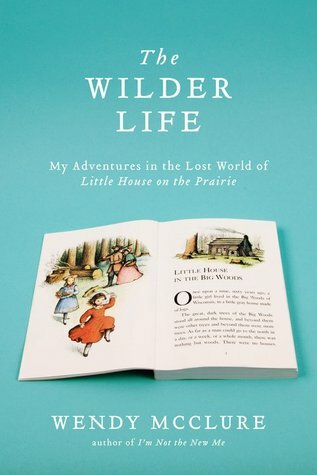 Wendy McClure is on a quest to find the world of beloved Little House on the Prairie author Laura Ingalls Wilder—a fantastic realm of fiction, history, and places she’s never been to, yet somehow knows by heart. She traces the pioneer journey of the Ingalls family— looking for the Big Woods among the medium trees in Wisconsin, wading in Plum Creek, and enduring a prairie hailstorm in South Dakota. She immerses herself in all things Little House—exploring the story from fact to fiction, and from the TV shows to the annual summer pageants in Laura’s hometowns. Whether she’s churning butter in her apartment or sitting in a replica log cabin, McClure is always in pursuit of “the Laura experience.” The result is an incredibly funny first-person account of obsessive reading, and a story about what happens when we reconnect with our childhood touchstones—and find that our old love has only deepened.